December in the Iowa City area is my family’s most favorite time of year. Yes, the teenagers are eagerly anticipating sleeping in everyday during the two week break from school, but it’s so much more than that. While they may have outgrown the big man in the red suit, there are still plenty of other holiday traditions that get us together as a family to enjoy the festivities, take a break from our hectic schedules, and make merry during this most wonderful season. It doesn’t feel like the holidays for us until it’s time for Coralville’s annual Aisle of Lights. 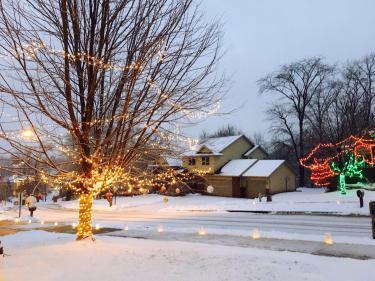 Since 1980, on the second Sunday in December, residential neighborhoods and businesses in Coralville have lined their sidewalks with luminarias - white paper sacks, filled with sand and a votive candle - creating miles of lighted walkways throughout the town. Many homes along the route are decked out with lights and yard decorations, with some set to music, to add to the merriment. This year the event takes place on December 9 and the City of Coralville, Iowa River Landing and other area businesses and organizations have several activities scheduled throughout the day to entertain revelers of all ages. One of our favorite family activities during the holidays is to attend one of the area’s many terrific theatre productions. Lucky for us, City Circle Theatre Company’s production of Disney’s Beauty and the Beast is running in December at the Coralville Center for the Performing Arts. There are several evening and matinee shows from December 7 - 9 and December 14 - 16. Downtown Iowa City is a treasure-trove of holiday activities all season long. We love to admire the architectural wonders of the Gingerbread House Competition. This year, it’s happening on December 9 at the Graduate Hotel so go check out the edible structures, or enter one yourself if you’re the crafty type, and then pop over to Coralville for Aisle of Lights. My kids start practicing their Christmas piano pieces right after Halloween in order to play in the Nancy Cree Keyboard Learning Center’s Holiday Showcase at the Old Capitol Town Center. Come enjoy some holiday music at this free event on December 15 and 16 in the food court and bring a non-perishable food donation to benefit the Crisis Center of Johnson County. After the kids perform in the Holiday Showcase, we’ll enjoy a horse drawn carriage ride through the Downtown District and I might even get them to hunt for an elf or two while we do some Christmas shopping. Speaking of shopping, we love to buy local and there are several craft and vendor markets to find those special gifts for family and friends. On December 8, we’ll start the morning up at the North Liberty Community Center’s Holiday Vendor Fair and then zip downtown to Merge for Not Your Mother’s Craft Fair. We’re sure to find something special for even the most discerning person on our list. In this as in every holiday season, we will enjoy selecting gifts for those we love, but more than anything we will treasure all the special traditions on which our family has built much-loved memories. Happiest of holidays to you and yours! Amy Sundermann is a freelance writer, brand strategist, mom and Hawkeye. She has written for the Iowa City Press-Citizen newspaper, the Iowa City/Coralville Area CVB, The Iowa City Downtown District, The University of Iowa, and other local organizations. Amy grew up in Eastern Iowa, left home to see the world after college, and returned to the Iowa City area 15 years ago to raise her family. She has never regretted that decision. Amy actively volunteers for a number of community organizations and, in her free time, enjoys performing in local theatre, traveling with her husband Steve, and exploring all the exciting opportunities the area has to offer.